There is now an is_embed conditional tag to more easily target embedded posts. New: Support for embedding video and audio attachments. 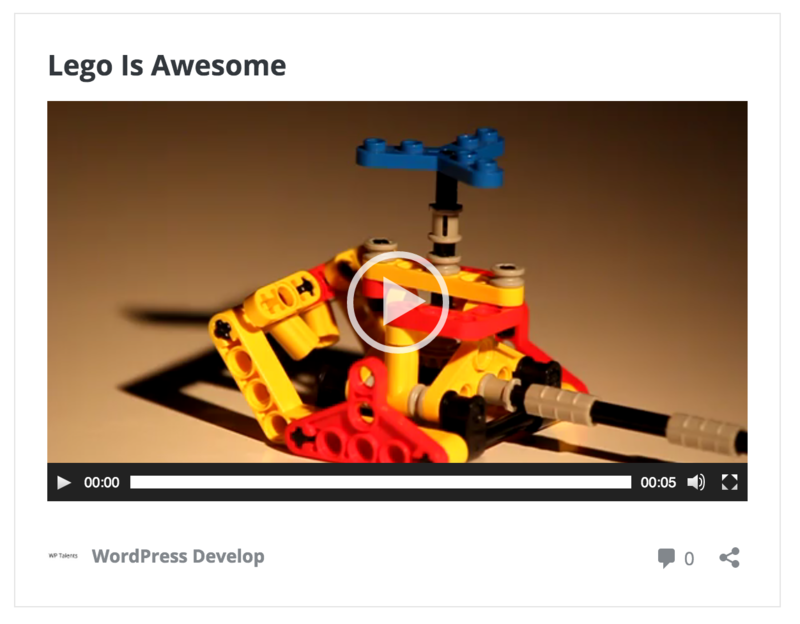 You can now copy the whole embed code and not only the post’s URL in the sharing dialog. We now show a read more link instead of the word count in the excerpt. Note: We received some feedback regarding weird link previews in Slack for WordPress.org links. This is a Slack bug and not our fault. We already reached out to them and hope it gets fixed soon. As always, the latest version of the plugin is available on the plugin repository. Errors and suggestions can be either reported on GitHub or our #feature-oembed Slack channel. Added translations for Spanish, French, Italian, Finnish, Hebrew. There are now 13 translations in total! Majorly improved embed handling: There’s now a 404 view for non-existent posts and we redirect to the right URL when post slugs change. The latter needs to be fixed in core though, see #33920. This was only possible because of great feedback from plenty of users. The plugin is running smoothly on lots of sites now, including WordPress.org itself! It will also ship to WordPress.com this week if everything goes as planned. We’re very happy with the plugin’s current form. Our priority tasks are now reviewing inline documentation and making sure the plugin is as secure as possible. If these are areas you’d like to work on, your help would be highly appreciated! After kicking off the oEmbed feature plugin a couple of weeks ago, it’s high time for another status update. In case you have missed it, the oEmbed API plugin makes WordPress an oEmbed provider, allowing you to embed blog posts just like YouTube videos or tweets. Of course everything happens with security and ease-of-use in mind. Embedding a post is super simple! The plugin is very stable so far. We’re looking into bringing it to WordPress.com for testing, but of course we also need your help to bring this further! Download the plugin from the repository — play with it, break it, and help us fixing all bugs that may appear. We’re always looking for areas to improve. We’re now mainly working on getting it into shape for an eventual core merge proposal and implementing the different oEmbed response types. 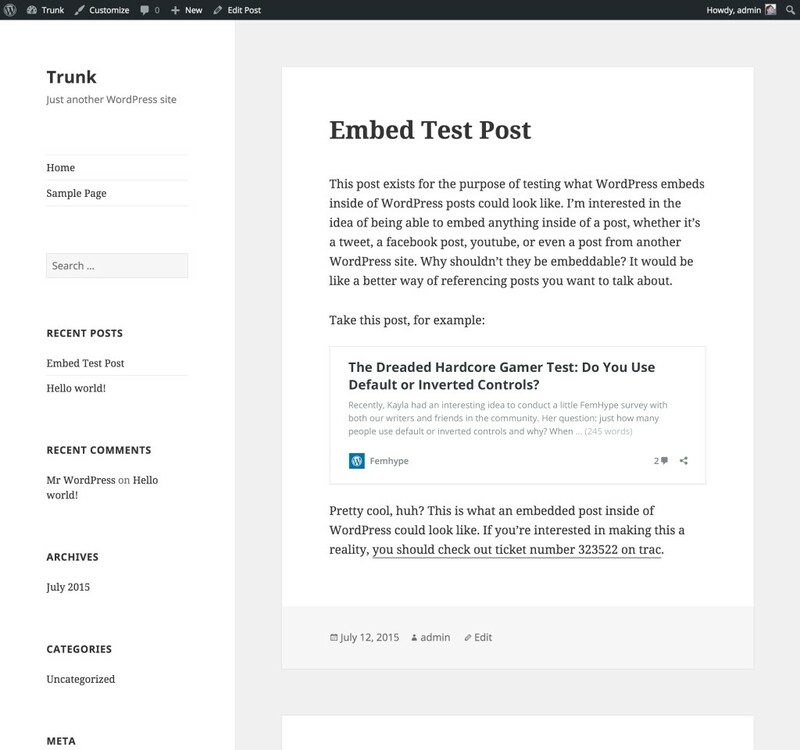 This means supporting embedding attachment posts and posts with different post formats. Please, test and report both errors and suggestions either on GitHub or our #feature-oembed Slack channel. Anyone is welcome to join us! Yesterday we held our first weekly chat in #feature-oembed. Hooray! There were quite a few participants already, which is great. We agreed on keeping the embeds simple and minimally styled. WordPress has no endpoint. We scrape the referenced websites to get data for a preview. Kinda like Facebook, Slack or Twitter show previews for links. We decided on first finishing the HTML, as we need that anyway. After that we can focus on the next steps. Development happens on GitHub, where we’ll be filing a couple of issues to work on until Monday. Anyone is welcome to contribute to the plugin.